We have been working with Dr. Charles G. Haddad since 2004, this includes consultation, collaborative management and referral as needed. Dr. Charles G. Haddad is board certified by the American Board of Obstetrics and Gynecology and a long time resident of Northern New Jersey, where he has been a leader in the women’s healthcare and surgical community. He has acquired a broadened familiarity of the New Jersey medical community by serving in a variety of OB/GYN positions, including that as of faculty attending at Somerset Medical and Hackensack University Medical Center at Mountainside Hospital, assisting clinical professor at Mount Sinai, and department chairman at St. Mary’s. He also served as chief resident in the OB/GYN department at St. Joseph’s Hospital and Medical Center. His professional memberships include the American College of OB/GYN, the American Medical Association (AMA), the National Arab American Medical Association (NAAMA), the Syrian American Medical Society (SAMS), and he is a Fellow of the American College of Obstetricians and Gynecologists (FACOG). Dr. Haddad has been in private practice since 2001, and currently maintains hospital affiliations at Hackensack Meridian at Pascack Valley Hospital in Westwood and St. Joseph’s Medical Center in Paterson. 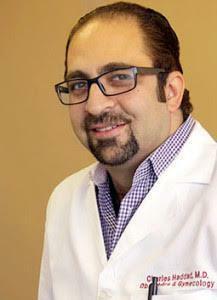 Born and raised in Syria, Dr. Haddad received his medical degree from the Faculty of Medicine of Damascus University.